“Wonder who it’s going to be” Today at Pt. England school we were going to have a special guest come into our school to give us a cheque worth of one hundred thousand dollars. 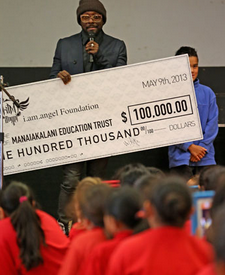 The day before the special guest came to our school, we didn’t know who it was and how much the money was. I couldn’t wait to see who it was. I was personally excited because all the prefects got to greet the celebrity into our school and shake our hand. I thought it was going to Stan Walker or any celebrity from New Zealand, But I didn’t know anything. Mr. Burt said that if he told anyone the secret celebrity wouldn’t come and we wouldn’t get a cheque. We were going to find out who it was the next day, I COULDN’T WAIT! It was finally time to meet our special guest. I was really excited to see who it was going to be. Everyone gathered into the school hall all excited to see who it was going to be. 5 of the prefects were outside waiting to greet in our special guest. There were flashes of lights everywhere and large video cameras were everywhere. “I know you guys have been excited about the celebrity that’s coming” Mr. Burt said. “Well you are going to find out right now” Goosebumps starting arriving on my arms and it was WILL.I.AM. WOW who would ever think it was going to be him, and I get to shake his hand. 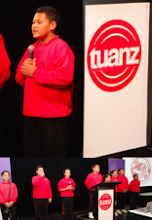 He got greeted into our school with our kapa haka group and our senior hip hop crew. Both performances were amazing. Then WILL.I.AM had a turn of talking. He was talking about how he grew up in a poor neighborhood and how he had no dad. His story was very inspiring and it pushed me to push harder at my dream. l another celebrity comes to our school. What a great post you have done from Will.I.Am coming to our school. Sadly I wasn't there to see this extrasensory event. Lucky you were.